It’s a chilly winter day today here in Virginia. We’re still digging out of the 18+ inches of snow we received a few days ago. I was able to get out to the grocery store for Valentine’s Day on Friday to buy some nice ripe organic strawberries and some fresh mixed greens. 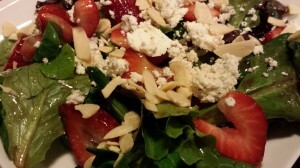 Out of that, my Strawberry Almond Goat Cheese Salad was born. 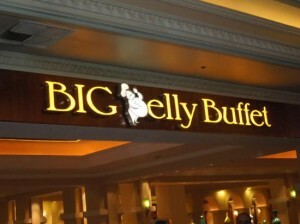 My husband just proclaimed that this is one of his FAVORITE salads! For this salad, you don’t need super ripe strawberries. In fact, you could probably add some blueberries and blackberries if they are available in your area. My Strawberry Basil Balsamic Dressing is a sweeter dressing than the usual balsamic, so your berries don’t need to be super sweet. Trader Joe’s has a nice three-pack of plain, black pepper, and herbed goat cheeses. 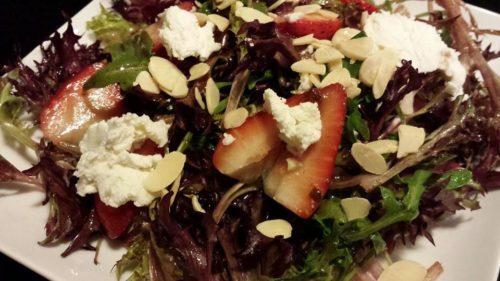 You can use regular goat cheese of your choosing or pick a flavor that you like for this salad. 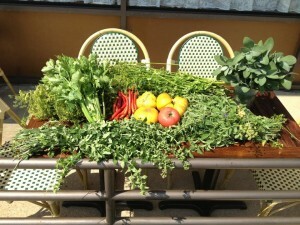 Start out with a bed of greens. I was able to purchase some nice mache salad greens which I mixed with the more readily available Spring Mix greens. 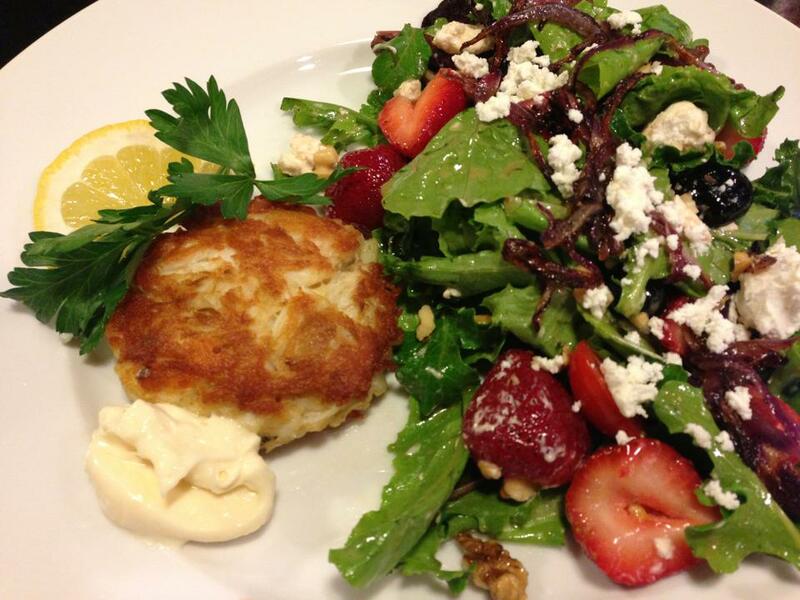 Toss the greens with the strawberry basil balsamic dressing and divide amongst salad plates. Slice the strawberries and mix them in a small bowl with some of the strawberry basil balsamic dressing. Top the greens with the dressed berries. 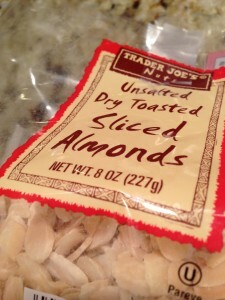 Sprinkle on some goat cheese (plain or herbed) crumbles, and a handful of sliced toasted almonds. (Trader Joe’s carries some good ones!) Serve! 1. 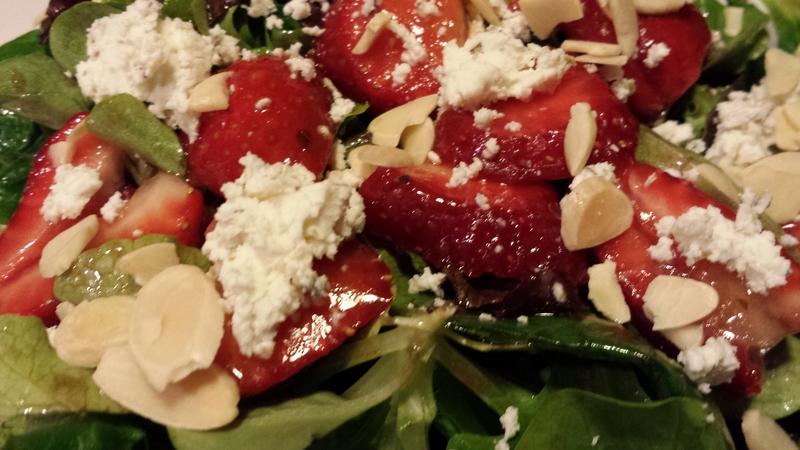 Mix 1/4 cup strawberry basil balsamic dressing with the sliced strawberries in a non-metallic bowl. Set aside. 2. 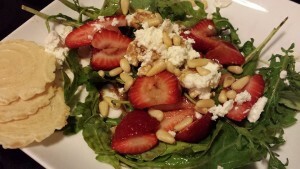 In a large salad bowl, toss the greens with the 1/2 cup strawberry basil balsamic dressing. 3. 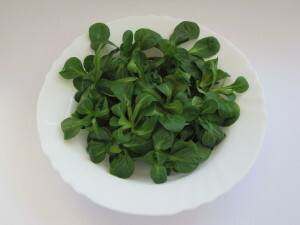 Divide the dressed salad greens amongst four salad plates. 4. Divide the dressed strawberries over the greens. 5. Sprinkle the goat cheese crumbles and then the almonds over the salads. Serves 4 as a salad course. Offer with a nice light shortbread cookie on the side as a change from the usual savory breads. This recipe can serve two people as a main course. Offer salt and pepper mills so that guests can season their salads. Variations: Use whatever greens you have on hand or are available in your area. Add other berries to the berry mixture. 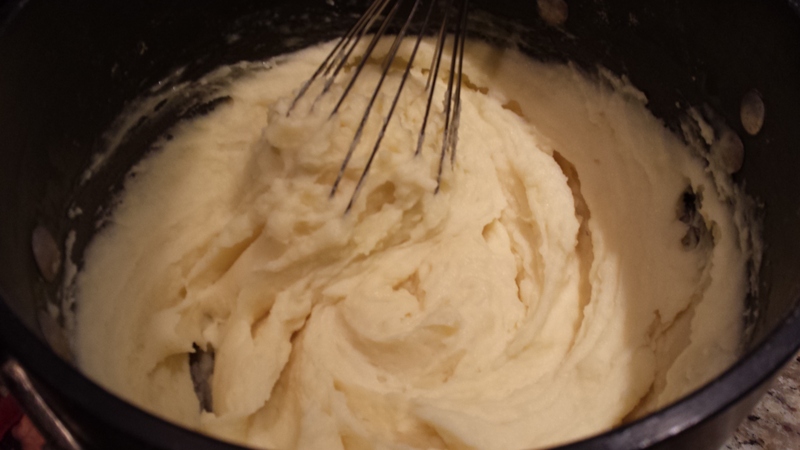 Use bleu cheese or feta crumbles instead of goat cheese. Substitute toasted pecans, pine nuts or walnuts for the almonds.